On 4 May 2015 during the visit to Georgia, Mr. Mircea Ciopraga, Secretary General of the PS IGC TRACECA met with Capt. Mr Mamuka Akhaladze, Director of LEPL Maritime Transport Agency at the Ministry of Economy and Sustainable Development of Georgia. Within the discussion, Mr. Ciopraga mentioned that transport industry has always played an important role in the regional economic development. Dynamic development and efficient operation of transport as a significant economic sector is a prerequisite for the achievement of high and stable rates of trade-economic development of every state, increase of the living standards of population and rational integration with the world economy. And maritime transport is one of the guarantors of economic stability. Mr. Akhaladze briefed Mr. Ciopraga on the goals and functions of Maritime Transport Agency. Maritime safety, organizational-legal regulation of maritime transport functionality and establishment of international standards are among the most significant. The main scope of the Agency’s work is a technical regulation of maritime transport field and rendering service therein, in terms of non-delayed and safe implementation of maritime cargo transportation and passengers’ movement. In view of ongoing TRACECA Maritime Safety and Security project and Regional Action Strategy on Maritime Safety and Security for the period up to 2021, Mr. Ciopraga and Mr. Akhaladze discussed the status of the implementation of international conventions, priority actions, activities and the monitoring in maritime field. 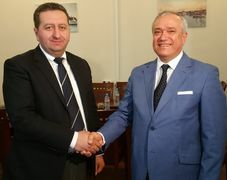 In addition, Mr. Ciopraga expressed his interest to Mr. Akhaladze to visit major Georgian ports and to get familiar with status of the development.